The series of presidential visits starting from Jogjakarta and Surabaya, for the umpteenth time the number 1 person in Indonesia is back to visit Papua, this time Nabire became the concentration of President Jokowi's visit. The purpose of the visit of President Jokowi this time is to inaugurate some State Vital Objects as a milestone for the welfare of the Nabire community in particular, among the vital objects that are inaugurated include the Nabire Hospital, Douw Seture Airport and PLTMG Nabire. The presence of Jokowi in Nabire was greeted by the Nabire people, as stated by Moni's Chief Soter Zonggonau, "In this Nabire there is a tribe of Moni and Dani tribe, we all really expect the father of jokowi to stop by Nabire, now finally Mr. Jokowi present here with us inaugurate what is the program to prosper our Nabire community, "he said, Wednesday (20/12). The festive reception and enthusiasm of the Nabire community signifies a harmonization between a State Leader and his people. Jokowi himself in his chances with the community while sharing a book entitled "Read, and the nation will be spared from blind because of ignorance". Third Facility to support the welfare of the community is a strategic program launched by President Jokowi for Papua. President Jokowi himself promised to raise the level of RSUD Nabire, because RSUD Nabire will be a referral hospital serving 6 districts. Douw Atuture Airport itself will be built into an international airport, while the PLTMG is the hope of the Nabire community for a long time, because Nabire is famous for the power shortages, before the PLTMG in one day Nabire get the power outage 5-7 times in a long time. With these three facilities, Nabire is now an area that is predicted to experience a significant increase in welfare. 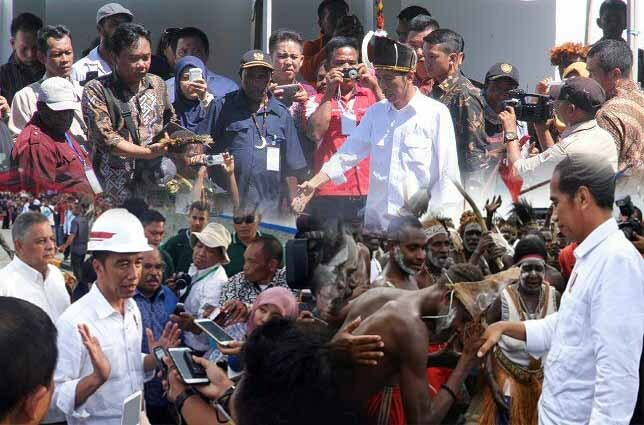 Even so, although the Nabire people are enthusiastically welcoming the arrival of President Jokowi, there are still a handful of people who consider the visit to be the image of the 2019 presidential election. Though the people themselves feel no political element when President Jokowi visits Nabire, the public feels a sincere heart leaders who want their people to prosper and prosper. "As Youth, we are grateful for Mr. Jokowi's program, we feel the sincerity of President Jokowi in building Indonesia, especially in Tanah Papua," he said. The Nabire people are hoping for opposing parties not to interfere with the government's ongoing development for the welfare of the Papuan people.